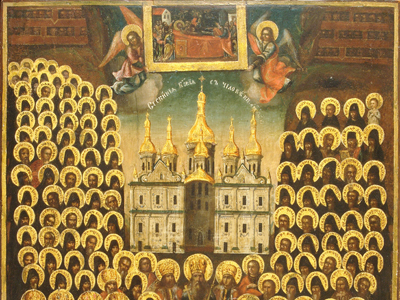 Today is All Saints Day and it has me thinking about the people who I carry along with me on this faith pilgrimage. Martin Luther is certainly one of those silent companions. And there are many, many more. You have them too. People who have been defining of the faith in some way. Like Luther, you may carry with you those only known to you from their writings. I have any number of these. People whose reflections on and proclamation of Christ come from generations long passed away but continue to carry me along in times of struggle, joy and confusion. Perhaps it is the influence of a mother or a father who, along with all the distracting peripherals in life, did not neglect their witness to the Word. There may have been grandparents and other relatives whose witness to the faith complemented that of your parents, giving it roots and a richer, deeper dimension. You may remember a Sunday School teacher or a pastor who unfolded the Bible, making it vivid and alive, telling the stories of the men and women through whom God revealed His will, His law and mercy. Friends in Christ have been there too; fellow parishoners, confirmations classmates, Bible study companions and others with whom you have shared the faith in worship, witness, learning and service. I, too, am a silent companion to others. Most of whom are unknown to me. We do leave our mark and we leave it every day. Our words and deeds, spoken and done in the name of Christ, also may be defining for someone. For good, we hope. But we cannot always be sure. Lord Jesus Christ, fall in my footsteps, work Your goodness in my actions and be heard in my voice. Pass me along to others, a silent companion on the journey whose only prayer is to be a simple underline of Your glorious Word.